This is the first illustrated edition of the diaries kept by Australian-born photographer and film maker Frank Hurley about his work on the Mawson and Shackleton Antarctic Expeditions, his two expeditions to Papua in the 1920s, and his experiences during the First and Second World Wars. Frank Hurley is best known today as a photographer and film maker. His major documentary films include ‘The Home of the Blizzard’, ‘In the Grip of the Polar Pack Ice’, ‘Sir Ross Smith’s Flight’ and ‘Pearls and Savages’, while his photographs of Douglas Mawson’s Australasian Antarctic Expedition, Ernest Shackleton’s Imperial Trans-Antarctic Expedition and the two World Wars have been so widely exhibited and reproduced that in many cases they are the principal means by which we have come to see those world-historical events. Yet there is another source, so far little known to the public, which also gives us a startling sense of the presence of the past: it is Hurley’s voluminous manuscript diaries, only brief extracts from which have so far been published. Originally written in the field in Antarctica, South Georgia, England, France, the Middle East, Papua and Australia, and later raided and revised for his many publications and stage performances, they have survived years of world travel and are now carefully preserved in the archives of the National Library of Australia in Canberra and the Mitchell Library in Sydney. 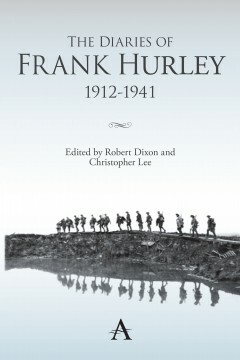 This illustrated edition of his diaries presents Frank Hurley in his own words, explores his testimony to these significant events, and reviews the part he played in imagining them for an international public. Robert Dixon is Professor of Australian Literature at the University of Sydney. He is a Fellow of the Australian Academy of the Humanities and a past-President of the Association for the Study of Australian Literature, and has published widely on Australian literature, postcolonialism, Australian cultural studies, Australian art history, and early photography and cinema. Christopher Lee is Professor of English and the Associate Dean (Research) in the Faculty of Arts at the University of Southern Queensland. He is a past-President of the Association for the Study of Australian Literature and a founding editor of the association’s journal JASAL. His research interests include Australian literature, the history of criticism, public memory and the representation of war.